Many crime dramas have tried to be more subversive lately, with mixed results. While films such as Drive & Good Time have reinvented the crime genre, other films such as Gotti & White Boy Rick have failed in their attempts. 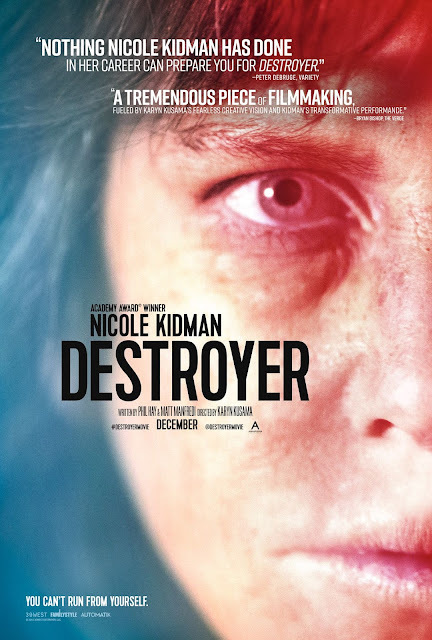 Destroyer, while showing some promise, ultimately fails to do anything fresh or intriguing. The film follows Erin Bell (played by Nicole Kidman), a detective for the Los Angeles Police Department. The years have taken a toll on Erin, as she is an alcoholic that is also overworked, which has led to a rift in the relationships between her, her ex-husband Ethan (played by Scoot & her daughter Shelby (played by Jade Pettyjohn). One day, Erin comes across a John Doe murder, & tells the responding officers that she knows who the victim is, but doesn't tell them. When she returns to the police station, Erin finds an envelope with a $100 bill stained from a dye pack. After tracing it back, she realizes that the $100 bill is from a bank robbery committed when she was undercover infiltrating a gang. Erin believes that this is proof that the leader of the gang, Silas (played by Toby Kebbell) has returned. Flashbacks reveal that Erin & her former partner Chris (played by Sebastian Stan) were both infiltrating the gang, eventually starting a romantic relationship & planning to take some of the robbery money for themselves. In the present, Erin is led to DiFranco (played by Bradley Whitford), a lawyer laundering money from the original robbery. After dealing with him, she finds Silas' girlfriend, Petra (played by Tatiana Maslany). Nothing will stop Erin in her mission to find Silas. The cast is amazing. Nicole Kidman is unrecognizable, & has so much intense command in her performance. Sebastian Stan & Tatiana Maslany are the most notable of the supporting performances, but this is definitely Kidman's film. Karyn Kusama's direction is mediocre. Kusama knows how to build tension, but she rarely delivers on actually reaching a powerful climactic moment. And the screenplay by Phil Hay & Matt Manfredi is a mess. The plot is way too confusing, the characters aren't fully realized, & some of the dialogue is badly written. This is a major disappointment. Although the cast is excellent, especially Kidman, that's just about the only positive thing in this film. Destroyer was seen by me at the MJR Troy Grand Digital Cinema 16 in Troy, MI on Friday, January 18, 2019. It is currently in 2 theaters in the Detroit area: the MJR Troy Grand Digital Cinema 16 in Troy, MI; & the Emagine Royal Oak in Royal Oak, MI. Its runtime is 121 minutes, & it is rated R for language throughout, violence, some sexual content & brief drug use.